Make baby shower invitations that are cute and simple using our printable templates. These invitations are super fast and easy to make! Simple and chic! Step One: Choose a card stock to match your color scheme. I chose pink to go with the whole "baby girl" theme. Actually, I used pink for everything on the invitation shown. Of course, you could use any color to go with your baby shower theme, or simply blue for boy, etc... 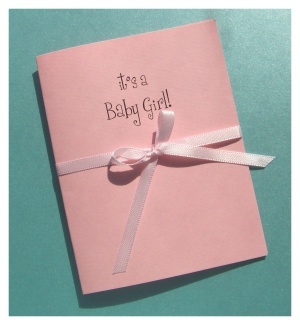 Anyway, once you have chosen a card stock to make baby shower invitations with, the first step is to print onto the paper. Use my printable invitation template to print onto the card stock. Load the paper into your printer and print it out. If you have 50 invites to make then print 25-30. Each piece of printed cardstock makes 2 invitations, and of course, you'll want some extras for any mistakes and mess ups. The front will read "it's a baby girl" or "It's a Boy!". Now turn the printed pages over and load them into the printer facing upside down. Print the template over again. I recommend printing just one at first so you know you have the orientation correct. Each side of the paper should be facing the opposite from each other so that when you cut the paper in half it creates two perfectly printed cards. Step Two: Cut the card stock in half. Cut the paper in half width wise to make two pieces measuring 5 1/2" by 8 1/2". Step Three: Fold the paper in half to to create 2 folded cards. Handwrite the invitation details to the inside. Step Four: Attach a decoration. Notice I placed a rhinestone where the apostrophe in "it's" should go. You do not have to use a rhinestone but I thought it was cute. They can be pretty expensive in the stores but I have a trick to get them cheap. Check the nail art section in any drug store or places like Wal-mart or Target. Where the sell the nail polish. If you look in the kids nail polish you can find tiny cute rhinestones for around $1.00. Another alternative would be to use a very small paper punch and punch a heart or circle shape out of colored paper. Or even cover it with glitter for added effect. 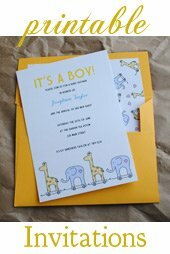 By adding some sort of bling you can make baby shower invitations with flair that and style without breaking your budget. Step Five: Tie a ribbon around the card. Simple, Just cut a length of ribbon and tie it in a bow. A little trick I use to make this as simple a task as possible is to dab a small amount of adhesive on the card stock using a glue runner. I dab it right where the bow would be tied. It kind of acts like that little extra finger holding the ribbon while you tie the knot. Just pull the ribbon into the first knot and press down. Viola! It's stuck into place. Now you can tie your bow with ease.